What a time to be mentally aware, cognizant and healthy. U.K singer-songwriter Eckoes releases her vital single “Hurricane of Storms” at no better moment and no better day. Reflecting the current topical time of increased mental health awareness, the "It’s OK not to be OK’ messaging is clear and comforting here. Her dexterity for lyrically expounding her coping mechanisms, the sonic escape and the releases she wants listeners to gain from this record is impeccable. With her diacritic vocals, fearless aura and daring revealing soul - she separates herself as an artist and as a survivor of the worlds perils amid remaining sound due to music. Recently talent scouted by Grammy Award winning producer Naughty Boy (Beyonce, Sam Smith, Emeli Sande) & a selected INES Talent 2019 Artist, British musician ECKOES is a rising star and breath of fresh musical air. On the back of live shows with the industry mogul, ‘Hurricane of Storms’ is the 2nd release from her forthcoming dark electronica EP. Merging other worldly textures & intimate sensual vocals, she invites us into her sublime and unique sonic world - hitting that sweet spot of industrial yet ethereal. This record is imperative for the state of the contemporary era; take a listen below. Listen to “Hurricane of Storms” here. 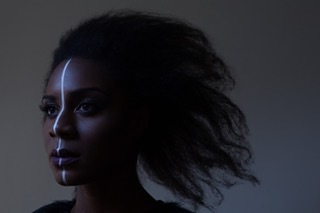 Nicole Bus Releases a Rousing Ode to Black Men in Debut Single "You"
Lacy Cavalier Has a Voice of Pure Butter on New Single "Blue Suede Couch"
Grace May Depicts Feelings of Loneliness in New Single "Quiet"